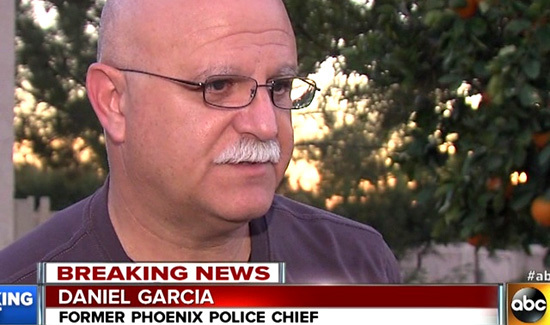 Chief Garcia has raised the ire of the Phoenix Law Enforcement Association on more than one occasion. PLEA President Joe Clure said he was outraged when the chief refused to help Officer Craig Tiger who was diagnosed with PTSD during treatment for alcohol abuse after he was arrested for DUI one year following an incident where he was forced to take the life of a suspect. Instead the chief opted to fire Craig. After he was fired, his ability to continue with needed psychological counseling for diagnosed PTSD was greatly diminished. After his termination, Craig continued to struggle with the demons of depression and nightmares that continued to plague him. He ultimately took his own life this past November. Click here to read more about Tiger’s story. So what does the story of Craig Tiger(as sad as it is) have to do with Chief Garcia’s termination?